My NEW Morning Substitute for Coffee! I have always been a lover of drinking hot tea in the afternoon, but now I’m really digging it in the morning, too. 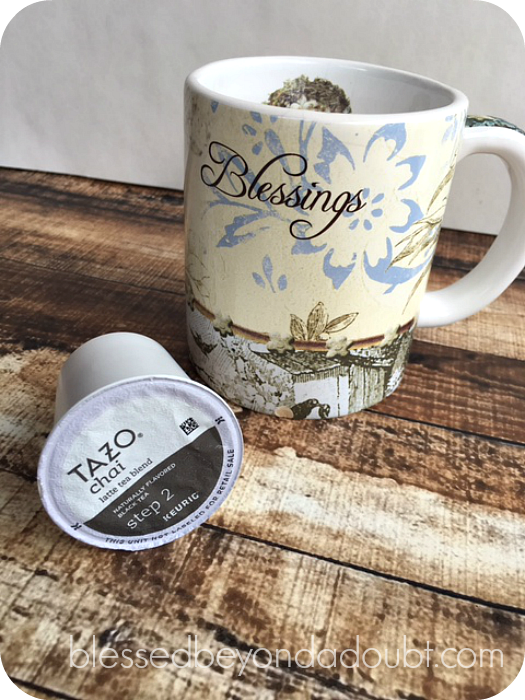 Have you tried NEW TAZO® Chai Latte K-Cup® pods yet? It consists of a creamy blend of black tea, cinnamon, ginger, cardamom and vanilla flavor. It simply has the perfect blend of sweet meets spicy for this mama. In the past, I’ve enjoyed this sweet, spicy, and bold blend of tea at the local coffee shops, but now I get to enjoy it at home daily. And what’s even more convenient is that I can make this treat using my beloved Keurig®. The NEW TAZO® Chai Latte K-Cup® pods are made from milk, tea leaves, and spices that satisfy me completely in the morning. 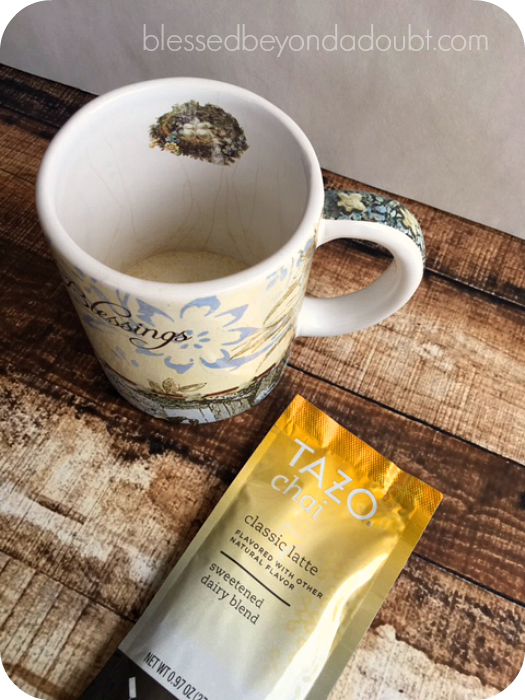 I have a tendency to drink hot tea in the afternoons during the cooler months, but I have been looking forward to my quiet time with my hot TAZO® Chai Latte in the morning when I rise. TAZO has partnered with New York Times Bestselling author and host, Padma Lakshmi, to celebrate the release of the new K-Cup® pod. Chai is a black tea blend that’s part sweet, part spicy, and totally unexpected. It has been steeped for thousands of years in Indian history. Tea and chai have always been a huge part of Padma Lakshmi’s family heritage, and she is anxious to introduce the flavors of chai with TAZO with other tea lovers. She has concocted tasty recipes that pair perfectly with a hot mug of Chai tea. There is a two-step process to brewing the perfect NEW TAZO® Chai Latte. First, you pour the creamer that comes in a pouch in your favorite tea mug. Second, you put the NEW TAZO® Chai Latte K-Cup® pod into your Keurig®, making sure it is set for 8 ounces, and brew. Voila! Instantly you have a HOT NEW TAZO® Chai Latte. It’s so wonderful and completely satisfying to me. My husband even fell in love with it. He actually used the last pod and I had to purchase another box for us. 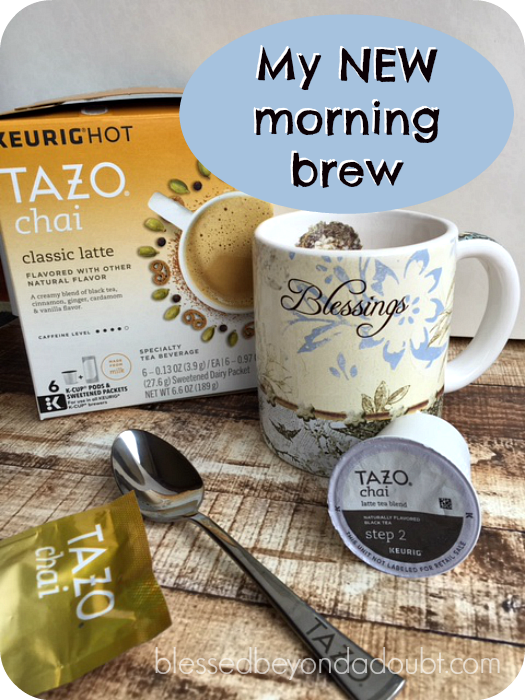 You have to try the NEW TAZO® Chai Latte K-Cup® pods and let me know what you think. You’ll be in for a real treat. « 3 SMOOTH Things I do for my Wife Before Bed to Enhance Intimacy! I recently bought the concentrate that comes in a carton. (You mix it with an equal part of milk or similar beverage and serve it hot or cold.) Like you, I think the blend of sweetness and spiciness tastes fantastic. By the way, you don’t mention how caffeinated the pods are, but my carton shows four out of five on the caffeine scale.